Remembering World War I – The Aftermath . . . I had a stake in World War I although I was born long after World War II. My grandfather on my mother’s side was a German soldier in World War I. Early in the conflict, he took a bullet in the lung and received no medical care while incarcerated in a French prison. After the war, which he managed to survive, his health was seriously impaired and he was in a medical facility which dealt with such cases. My grandmother, doing her part for the returning soldiers, was working there and so they met. They married and had two daughters, one of which died at birth and the other one was my mother. My grandfather died while my mother was still very young. Her only memory was of a tall, pale man who rescued her from a school of tiny fish that were tickling her toes while wading in the sea. She was raised by her mother and they lived on the small pension left by her father’s military duty. I never thought too much about this until my older son started asking questions about his relatives especially the German side of the family. He was a bit sad that the only memory my mother had of her father was so small and seemingly insignificant. He told me that when all memories of people are forgotten, they are forgotten on this earth and that is tragic as we are each a part of the living still. He said memories have to be cherished and passed on so they don’t die. He was very happy to have this small bit of his great grandfather now in his memory bank. Then he asked me what his great grandfather’s name was and for the life of me, I didn’t know nor remembered my mother saying it. I dragged out dusty boxes of photos, old black and white ones dated before World War II of my mother’s life growing up in German. Unfortunately, there was little notation on the backs of them but then I found a picture of a young girl that looked a lot like me at that age and there was writing on the back of the photo. We now had a name, a picture, and a memory. Memories are how we come to be and when you lose your past, it takes away from your future. On June 28, 1914, one hundred years ago, the Austro-Hungarian crown prince, Franz Ferdinand, was assassinated in Sarajevo. The shots were fired by a Serb Teenager, Gavrilo Princip. This murder set off World War I. The shots were in preparation for the invasion of Serbia. Things moved quickly at that point. Russia mobilized. Germany invaded neutral Belgium and Luxembourg and then moved towards France. At that point, Britain declared war on Germany. After the German march on Paris was halted, what became known as the Western Front settled into a battle of attrition, with a trench line that remained in place until 1917. Meanwhile, the Russian Army, on the Eastern Front, was successful against the Austro-Hungarians, but their invasion of East Prussia was stopped by the Germans. The Ottoman Empire joined the war in November of 1914 opening battle fronts in the Caucasus, Mesopotamia, and the Sinai. Italy and Bulgaria went to war in 1915, Romania in 1916, and the United States in 1917. The war started winding down after the Russian government collapsed in March 1917 and a revolution in November brought the Russians to terms with the Central Powers. On November 1918, the Austro-Hungarian empire agreed to an armistice. After a 1918 German offensive along the Western Front, the Allies drove back the Germans in a series of offensives and began entering the trenches. Germany was having trouble with revolutionaries and agreed to an armistice on November 11, 1918 which ended the war with a victory for the Allies. The war ended four, major imperial powers: the German, Russians, Austro-Hungarian, and Ottoman empires. The maps of Europe and Southwest Asia were redrawn with some independent nations restored or created. The League of Nations was organized with the purpose of preventing a repetition of such an horrific conflict. This aim, as we know, failed with the renewed European nationalism and the German feeling of humiliation contributing to the rise of fascism. All of these conditions led to World War II. *6 million went missing and were presumed dead. About two-thirds of the military deaths in World War I died in battle unlike conflicts that took place in the 19th century when most of the deaths were due to disease. Nonetheless, disease, including Spanish flu and deaths while in war prisons, caused about one-third of total military deaths. Cats and Their Place in the House . . . Which is Anywhere They Choose! Having a cat in the house is like dealing with a two year old! It is getting so that I have to wait until she goes down for a nap before I can get some things done. 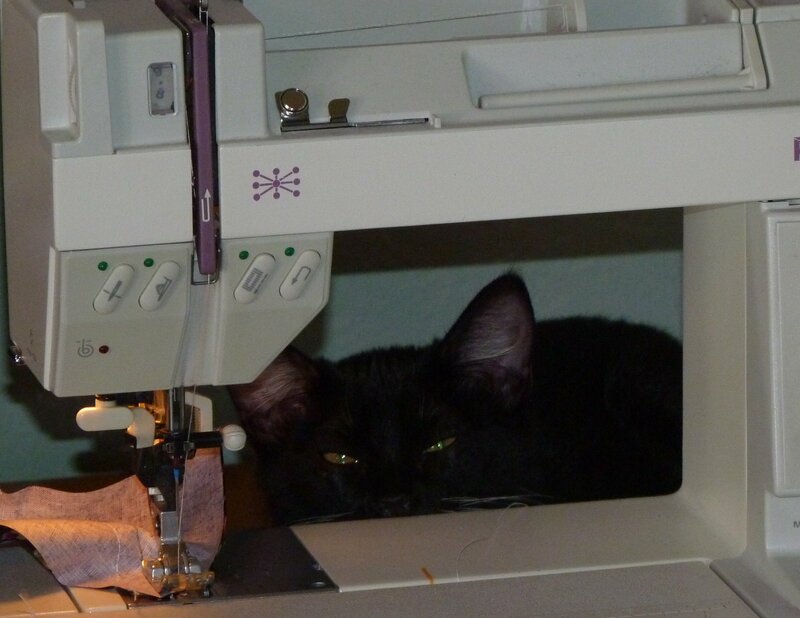 She is fascinated by the sewing machine and her favorite place to reside is right behind the action. And, if I’m not at the sewing machine, she goes where I go . . . which is in front of the keyboard of the computer . . . where she is right this minute! If the cat is napping somewhere in the house and suddenly realizes she is alone, her howling can be heard throughout the house as she wanders from room to room looking for companionship. The wonder of the loud meowing is that she is carrying one of her toys in her mouth when she does it. Initially, I planned to make cream of chicken soup for dinner. After a 90-minute telephone call with my son in Taiwan, the Asian influence came into play and we are having Asian Soupy Noodle Chicken Soup for dinner. My son called with the good news that he finished a book he is writing four months before the contracted deadline with the publisher. He plans to use the ‘extra’ four months to polish his writing, etc. Oh, and we will never be able to read the book as he wrote in in Chinese. We are excited, however, to see the book in print whether in Chinese or English. Are we of Asian descent? Nope! When my son was four years old, the old Godzilla movie was showing on television and my husband uttered the fateful words, “Look, you will like this movie!” and he did . . . very much. He lived and breathed Godzilla and all the Godzilla co-stars through high school. He wanted to learn Japanese in college so taught himself enough to pass the comprehension test at college and could start in the second year class. A twist of fate here. The second year class was only offered in the Spring and he was in the Fall semester. He noticed a Chinese language class was offered so took it out of interest and because he needed to fill the slot. He ended up majoring in Chinese Language and Culture and received his Masters at the National Taiwan University almost two years ago. He likes living in Taiwan and has a good job besides his writing. I miss him a lot but am happy that he has found a niche in the world that is comfortable for him. In the meantime, we are all looking forward to seeing the book written by the first author in the family! Having to Go Gluten Free Does Not Foreshadow the End Times . . .
As I’ve mentioned before, going gluten-free for us was an accidental health benefit. We initially decided to try this out of interest and a challenge. Within two weeks, we discovered that my husband no longer suffered from indigestion and drastically reduced his intake of medication just to survive a meal. A little research discovered that the lactose intolerance he dealt with for years and years but just a clamor from his body notifying him that gluten was the culprit. When we omitted gluten from our diet, he no longer at a problem with dairy products. No more digestive medication in order to eat a meal. Naturally, once we knew it was not going to be an experiment in diet but a lifestyle for the sake of my husband’s health, my time in the kitchen got serious. Yes, generally, the main necessities of eating didn’t involve gluten but we began to think wistfully of things like pizza, cake, cookies, pasta which would be difficult to work around. A lot of internet surfing, research, and reading and anyone who enjoys a meal at our home, doesn’t even realize they are eating gluten free. My first, gluten-free recipe book was a fortunate choice and the author made is clear that with some ingenuity and patience, most anything in the gluten world could be transported into the realm of gluten-free. Gluten-Free on a Shoestring by Nicole Hunn took the mystery out of cooking and baking gluten-free and, if you follow her recipes carefully, you can be successful every time. Gluten-Free on a Shoestring, Quick and Easy by Nicole Hunn soon joined my bookshelf. I think it was the chocolate donut on the cover that got me. Thanks to her, we can enjoy chocolate donuts, cinnamon donuts, powdered sugar donuts . . . along with 99 other great recipes in the book. When I heard about it, I immediately signed up and paid in advance pending publication of Nicole Hunn’s latest book Gluten-Free on a Shoestring Bakes Bread. It did not disappoint and we are able to enjoy sandwiches, rolls, and a ton more without jeopardizing my husband’s health. I did have a bit of nostalgia for my favorite American’s Test Kitchen recipes and magazines. Imagine my happiness when I was browsing through Costco, one day, and discovered America’s Test Kitchens has published The How Can It Be Gluten Free Cookbook! It seems to complete my wishes in a gluten-free world! The advantage of this cookbook is that they always explain WHY something is done or used in a recipe. Of course these are only four of a shelf-full of gluten-free books I’ve acquires in my wanderings. Last year I made a complete Chinese meal for my husband’s birthday including gluten-free Pot stickers. The Gluten-Free Asian Kitchen by Laura B. Russell is a staple in my cookbook line up. In other words, if you find your need to omit gluten and related wheat products from your menu, life is definitely not over. In fact, there seems to be more adventure in trying new recipes because you can! Top Ten Causes of Death in the United States . . . Interesting Statistics. Every time there is a shooting in the United States, these days, it immediately starts up the anti-gun factions as they feel that once guns are banned, murders/accidental deaths will plummet. According to the FBI, guns are not the weapon of choice in violent crimes. Also, guns are not at the top of the list for deaths. With a little research, you can also discover that school shootings are actually down and your child are less than a one percent chance of being gunned down at school. Needless to say, any death, one or many, is a tragedy but banning guns only takes them away from the responsible citizen and leaving them in the hands of people who don’t bother with the law in any respect. It is also interesting to note that while the noise in government these days is to ban guns because they are supposedly a major cause of death and injury in the United States, actual statistics seem to indicate an entirely different story. *According to the FBI, the #1 weapon used in violent crimes . . . is a baseball bat. Given the thinking/reasoning about proposed legislation regarding gun control, shouldn’t baseball bats be considered, too? Also heard that a lot of baseball bats are sold in the UK which has strict gun control. They play that much baseball there? We don’t need a nanny state. No matter what gets banned, people intent on evil will find a way.